Middle ear and sinus problems. Brain receives messages that contradict what the body perceives. An incorrect mental image of your position in relation to what is actually happening to the airplane. Kinesthetic (nerves in the skin, joints and muscles). Conflicting information from the three areas may result in disorientation if not overcome. The best things to do is to be confident on your flight instruments, more than your feeling. 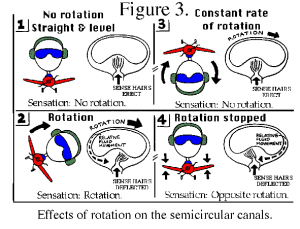 May occur when a banked attitude is entered too slowly to set the fluid in the vestibular system in motion but an abrupt correction is used to level the aircraft. Recovery from a spin and create the illusion of spinning in the opposite direction. The disoriented pilot returns the aircraft to its original spin. Losing altitude in a constant rate turn creates the illusion of being in a descent with the wings level.The disoriented pilot will pull back on the controls, tightening the spiral and increasing loss of altitude. Hypoxia means « not enough oxygen ». It can severely impair the function of the brain and other organs. Judgment, perception and mental ability, amongst others are affected. Blue fingernails and lips (Cyanosis). Visual impairment (tunnel vision, impaired night vision). Tingling and numbness in fingers and toes. Night vision starts becoming deteriorated already at 5000 ft cabin altitude. 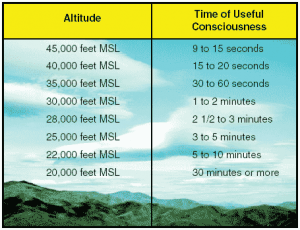 Descend to a lower altitude or using supplemental oxygen. Are nearly the same as for hypoxia, but instead of cyanosis, and limp muscles, the person experiencing hyperventilation will have get a pale appearance, and possibly muscle spasms. Control breathing rate. Try restoring CO2 levels by breathing in a paper bag. If unsure whether it’s hypoxia or hyperventilation – treat for hypoxia! Brain receiving conflicting messages about the state of the body. Common among passengers and some inexperienced pilots. Start with short lessons, gradually longer. Medication is not recommended while piloting. General discomfort, nausea, dizziness, paleness, sweating, and vomiting. Colorless and odorless gas produced by all internal combustion engines. Attaches itself to the hemoglobin in the blood about 200 times more easily than oxygen. Aircraft heater vents and defrost vents. Drowsiness, and/or loss of muscle power. Inexpensive carbon monoxide detectors. Turns black when exposed. Open fresh air vents and windows. Tobacco smoke also causes carbon monoxide poisoning. Effects similar to flying at 8,000 feet. The body’s response to physical and psychological demands placed upon it. Release chemical hormones (such as adrenaline) into the blood. The blood sugar, heart rate, respiration, blood pressure, and perspiration (transpiration) all increase. Physical stress (noise or vibration). Acute (grave,aigu) stress (short term). A certain amount of stress increases performance until it exceeds a specific level. Frequently associated with pilot error. Degradation of attention and concentration, impaired coordination, and decreased ability to communicate. Critical loss of water from the body. The first effect of dehydration is fatigue. Increased risk at hot summer days and/or high altitudes. If this fluid is not replaced, fatigue progresses dizziness, weakness, nausea, tingling of hands and feet, abdominal cramps, and extreme thirst. Drinking and performance deterioration are closely linked. Alcohol drastically reduces the chances of completing a flight without incident. With a hangover a pilot is still under the influence of alcohol. Don’t drink before a minimum of 8 hours pass between drinking alcohol and piloting an airplane. Good idea to be more restrictive than that. Performance seriously degraded by both prescribed and over-the-counter medications, as well as by the medical condition they are taken. May impair judgment, memory, alertness, coordination, vision, and the ability to make calculations. If there is any doubt regarding the effects of any medication, consult an aviation medical examiner before flying. The bends can be experienced from as low as 8000 feet MSL. 12 hrs after dives which has not required a controlled ascent. 24 hrs after dives with controlled ascent. Should be at least 24hrs after any scuba dive. Because it takes several weeks for the blood circulation to return to normal after a blood donation, it’s recommended that pilot who are actively flying to refrain from volunteering as blood donors. It’s recommended that you should wait at least 48 hours. The stress of flying, or indeed of any activity, consume energy. This energy is derived from oxygen and from blood sugar. The pilot is unwise to fly for too long without eating. His blood sugar will be low (hypoglycemia), that is, his energy reserve will be low. Reaction will be sluggish (lente) and efficiency will be impaired. It’s good precaution to carry a nutritious snack on long flight. Differences in pressure due to climbs/descends between the outside air, and the air in the middle ear, or in the nasal sinuses may cause discomfort and pain. Worst during descent. Pressure equalized through Eustachian tube, which can be opened through chewing, yawning or valsalva maneuver. During a cold, sinuses and the Eustachian tube may be swollen, equalizing will be harder. Pain and discomfort in sinuses, ears, teeth. Attempt to equalize. Reduce rate of descent/climb. What can be the causes of hyperventilation ? How long is the minimum time required after drinking alcohol before flying? What do you have to do to counteract the effect of spatial disorientation and illusion?